So you care about white supremacy? Do something. When we isolate them and their extremism, we miss the point that white supremacy is part of our culture and it’s something that ALL WHITE PEOPLE benefit from. “The overtly racist White Supremacists marching in Virginia are not a part of a binary, they’re part of a scale. 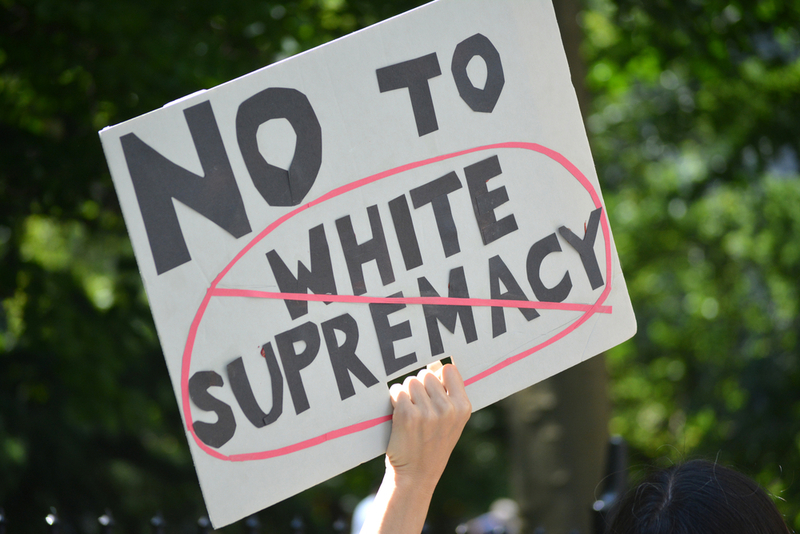 When we capitalize the words “White Supremacy” and treat it like a monstrous philosophy, it is an extreme that can be handily rejected by the majority of whites. “However, on the same spectrum, less extreme, are the various forces that lead to the overrepresentation of whites in nearly every desirable facet of society, and to the contempt and distrust with which POC are seen. We have decided to call these things “white privilege,” but one rarely mentioned aspect of white privilege is the privilege to use language to pretend it isn’t white supremacy. Richard Spencer and his ilk are the id, not an aberration but rather a natural byproduct of unchecked white privilege.” From the article Why Privilege is White-Washed Supremacy. If we all benefit from it, then we all must participate in dismantling it. This is not just a leadership problem (though good leadership would certainly make a difference). It’s not just an American problem (there’s lots of racism here in Canada too). It’s a problem that every one of us can participate in addressing. 1.) Do an inventory of how white your lens and life are. Do you surround yourself with white friends? Are your bookshelves full of books by white writers? Do you primarily watch TV shows and movies with white people in them? Are you doing business with, banking with, signing up for courses with, and hiring mostly white people? If so, ask yourself what you need to do to change the fact that you are centring whiteness. 2.) Listen to, read, and amplify the voices and wisdom of people of colour. Commit to reading only books written by people of colour for a year. Share at least one article each day on social media written by a person of colour. Sign up for courses with people of colour. Follow them on social media. If you have a public platform, share it regularly with voices that your audience needs to hear from. 3.) Buy from and amplify businesses owned by people of colour. You can do a lot of good by being more intentional about where you spend your money. Do your research and search out businesses owned by and run by people who look different from you. And then tell all of your friends about where you’re spending your money, not as a way of bragging about how socially conscious you are, but as a way of promoting these businesses and supporting their success. 4.) Consider the power of your vote. Do your research about the people you’re voting for. If you can, support people of colour running for political office (if they represent your political views). If the candidates in your neighbourhood are white, then at least talk to them about what they’re doing to address racism and white supremacy. Don’t just take their word for it – find out who they’re hiring, who they’re engaging in their campaigns, and who they’re doing business with for a better picture of how white their lens is. 5.) Talk to your racist neighbours, friends, family members, grocery store clerks, bus drivers, etc. Stand up for the people they dismiss. Challenge their attitudes. Invite them to multi-cultural events or lectures where they can expand their thinking. Don’t just ignore it because “they’re otherwise such kind people.” When you’re silent, you are complicit. 7.) Research and send money to non-profits run by and working with communities that have suffered from oppression/colonization/conflict/etc. Non-profits that are run by white people, that have mostly white people on the board and on staff, etc. may be upholding white supremacy by not including the voices, wisdom, abilities, etc. of the people they say they’re serving. Note: I specifically said “send money”, because if you choose to send them the physical items YOU THINK they need, then you are taking their autonomy away. Unless they ask for specific items, let them make their own decisions by giving them money to spend as THEY see fit. 8.) Stop spiritual bypassing or other avoidance techniques and dare to peer into the shadow side of our culture. If you believe in “love and light” than dare to shine that light into the darkness of racism and white supremacy rather than trying to pretend that “we are all one race” or “I don’t see colour”. The fact that you have the option to avoid this kind of negativity is a sign of your privilege. Your spirituality is selfish if it lets you “rise above” the ugliness of the world. 9.) Learn to sit with discomfort. Do the personal work (mindfulness, therapy, coaching, etc.) that will build your resilience and help you deal with negative emotions in a more healthy way. If you are always running away from fear, shame, anxiety, etc. then you won’t have the courage to step into difficult conversations where you might be challenged for your white privilege, covert racism, etc. If you shut down every time someone expresses an opinion different from yours, then you’ll stay in your little bubble and not contribute to the change this world needs. 10.) Find places for conversations and meaningful action. Join an ally group that supports the causes of people of colour (eg. SURJ). Start a conversation circle where you can wrestle with the hard conversations. Seek out Facebook groups or other social media forums. DON’T rush in to do what YOU think needs to be done – instead, follow the leadership of the people most impacted by the issue and LISTEN. troubling. My Girls do not visit at all, and have thrown me away.Some days I am very suicidal. MY Daughter has Bipolar and is telling the Family what a dreadful Mum was..Al lies, as she had everything I could manage to do for her, and help. Just a quick letter, as I am not sure what I can do about it all.